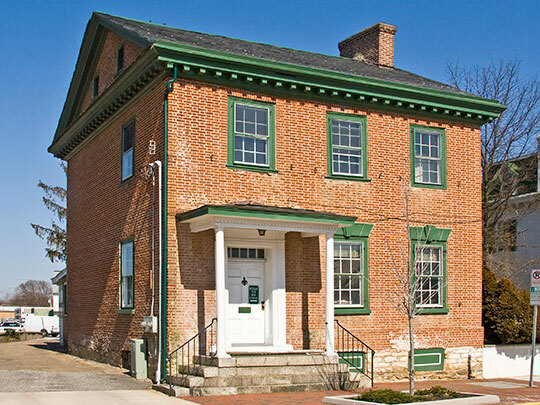 Elkton Town Hall is located at 100 Railroad Avenue, Elkton, MD 21921; phone: 410-398-0970. Photo: Mitchell House, ca. 1769, 131 East Main St., Elkton, Maryland. Built by Dr. Abraham Mitchell, a physician from Lancaster County, PA. Listed on the National Register of Historic Places in 1976. Photographed by User:Acroterion (own work), 2010, [cc-by-3.0 (creativecommons.org/licenses/by/3.0)], via Wikimedia Commons, accessed May, 2014. The Town of Elkton began as a village, serving travelers on the important Post Road, established in 1666 between Philadelphia and the southern territories. Named Head of Elk by the English explorer Captain John Smith in 1608, the Town was an early shipping point for the wheat raised in the Piedmont surrounding the settlement. In 1787 the town came to be known as Elkton. During the American Revolution, Elkton played a role for General George Washington, Lafayette, and British General Robert Howe. British troops numbering 15,000 to 18,000 passed through the area in August, 1777 on their way north to capture the American capitol in Philadelphia. In March 1781, Lafayette's troops also embarked from Head of Elk for Annapolis on their way to Yorktown because the Bay was controlled by British ships. The British returned on April 29, 1813, but Elkton was saved from burning by defense from Forts Hollingsworth and Defiance in the War of 1812. In the early nineteenth century, wheat grown in Lancaster County, Pennsylvania was milled at gristmills on the Big and Little Elk creeks, which also supplied waterpower for small paper and textile factories. Elkton also played a role in the War of 1812, undergoing British attacks in 1813 along the Elk River. Subsequent attacks by the British were driven back by guns at Fort Defiance and again by militia at Cedar Point opposite Fort Hollingsworth. Since World War II, Elkton has become increasingly industrialized and urbanized. In the early 1900s Elkton was home to several sparkler and fireworks manufacturers. During World War II, the well-established fireworks infrastructure was easily modified to allow for the large-scale production of munitions, flares, signals and other pyrotechnic devices. This caused a heavy in-migration of workers to Elkton and its environs and construction of substantial additional housing here. After the war many people stayed on to work in the new industries that were locating in the area. Since then, the Town's population, with the exception of a slight decline during the 1960s has grown steadily. Town of Elkton, Maryland, Comprehensive Plan: History, 2010, www.elkton.org, accessed August, 2012.